Every year, I struggle with how to get my ideas down about the MCN conference. It’s such a particular atmosphere, like the best ephemeral experiences always are. I’ve come to it with a different attitude each year, in a different place in my life, and I’ve left it feeling different things, too. I’ve been delighted, I’ve been exhausted. This year was no less complex a mix. 2018 has been a wrenching, anxious year in the United States, full of worries about the state of the world and the state of public conversation and how much human compassion and decency seem to have disappeared from both. That anxiety has been a hovering miasma over my life this year. Having worked on the MCN program committee that decided this year’s conference theme would be Humanizing the Digital, I can’t honestly say I was coming in feeling my own most fully humanized. My tweet from November 8, 2018, reading “Looking forward to quality time at #MCN2018 next week with museum gaggle folks. It’s gonna be a quieter conference for me (not feeling the energy right now for 3 days of extroversion), but that doesn’t mean I don’t want to talk. Come say hi! (and I’ll aim to tweet, too)”. Leading up to the conference, I was feeling painfully aware that my usual level of energy for life just isn’t there these days. The prospect of live-tweeting (previously something that’s amped up my anticipatory excitement) felt like an insurmountable challenge. The thought of three days of meeting new people, seeking out new sights, and talking in large groups (all of which used to sound great to me) seemed instead like an arduous slog. I needed something different from MCN this year. I wasn’t looking for cheerleading, I wasn’t eager for a show and tell of the newest, neatest projects in AR/VR/podcasting/other museum trends, and I didn’t want to get mired in constant talk about the challenges of museum work in 2018. I wasn’t sure what it was I was looking for. Frankly, I went to Denver concerned that I might not be in the best frame of mind to fully appreciate the MCN community, that maybe this year’s conference was going to leave me feeling out of step. Turns out, I needn’t have worried. Turns out, what I needed (and gratefully found) was presence. MCN 2018 was a conference that began with Kate’s Ignite talk, Sometimes We’re Not Fine, calling us to be honest over the ensuing few days when people asked “How are you?”, even and especially when that meant telling someone that things might not be going so well. You can watch it for yourself right here, and I recommend that you do. It’ll only take you five minutes. A video of Kate Livingston’s Ignite talk from MCN 2018. It was a conference full of conversations with many people who felt a niggling, ill-defined blend of transition/tension/apathy/uncertainty/frustration about the museum field writ large and also their individual places in it. It was a conference where I heard much more about the state of the museum worker than I did about the state of anything specifically technology-focused. What it was not (at least, not for me) was a conference dominated by the everything’s-on-fire outrage that seems to permeate our culture right now. Certainly, there was some of that, and it was well-warranted. It’s not that there was no protesting over common topics of concern (brain drain, unjust and inequitable labor practices, stagnating institutional culture, to name only a few). It’s that the tone was not fury but fortitude. That concerns were acknowledged without an accompanying, unsatisfiable need for neat resolution. The MCNers of 2018 felt ready to hunker down and weather the messy, nuanced, unresolvable storm that is our work right now. As I’ve thought and talked and written my way through these post-MCN thoughts, this is what I keep coming back to. In a moment where the world feels consumed by divisive rhetoric and relentless, reactionary anger, this year’s MCN conference took a different path. Amber Case keynoted about calm technology. The Slow-Looking Room gave attendees a chance to quietly focus and recharge their emotional batteries. The UX Lounge offered a full day of participatory explorations of human-centered experience design. Thursday might as well have been dubbed Empathy Day, as four separate sessions (including my own… more on that shortly) put that word in their titles. And the schedule was full of the type of session I refer to as #MCNTherapy. These are the sessions that hold space for discussing complicated realities of the museum field, for sharing our vulnerable selves, for talking about how we persevere when work gets hard or we feel disillusioned. They’re often conducted under the Chatham House Rule, which allows people to share learnings from a conversation without direct attribution, to protect individuals’ privacy. #MCNTherapy sessions are the ones with titles like Should I stay or should I go? (which came complete with expected accompanying sound cue from The Clash) and Pain Points & Sweet Spots and You Can’t Be Neutral on a Moving Train. They’re the ones that ask for active participation from attendees. They break apart the expected “Presentation+Q&A” conference session format to make new ways for people in the room to share and think. You can’t show up to these sessions and listen half-assedly from the back. If you want to get something from them, you’ve got to give something in return. You’ve got to truly be there. This year, there were enough #MCNTherapy sessions you could practically have filled your entire conference agenda with them. A group selfie of the Empathy Jam session presenters. Left to right: Liz Bouton, Beck Tench, Jason Alderman, Mimosa Shah, and me. I’ll use my own as an example. Along with an excellent team of co-presenters, I offered up an early morning Empathy Jam that led our attendees through several exercises intended to build empathy, followed by discussion of how digital technology might help or hinder in that quest. 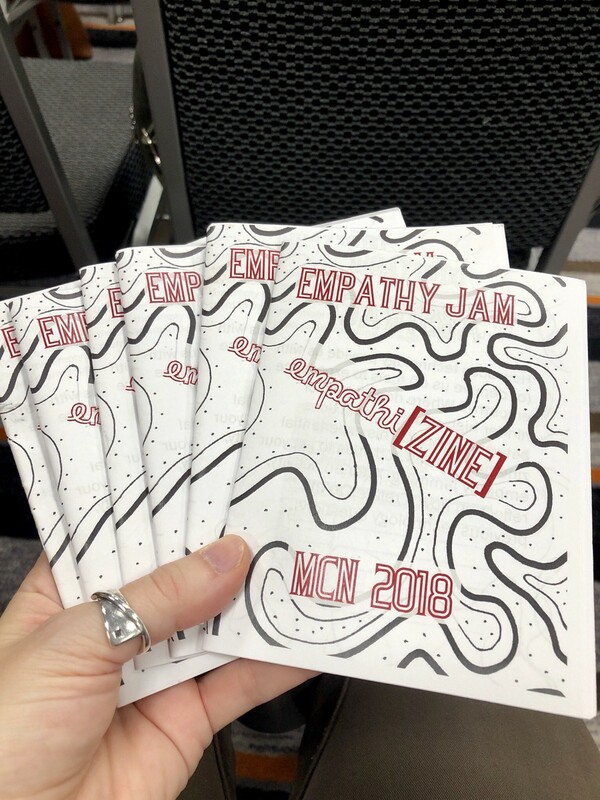 A photo of my hand holding six fanned-out copies of the empathi[ZINE]. The conversations I had and the number of people who thanked me for that session throughout the conference were a palpable reminder of the openhearted MCN community, earnestly welcoming and appreciating what was offered. All these #MCNTherapy sessions were a through-line reminding me to appreciate the people in those rooms for what they had to share in the moments where we connected with each other. 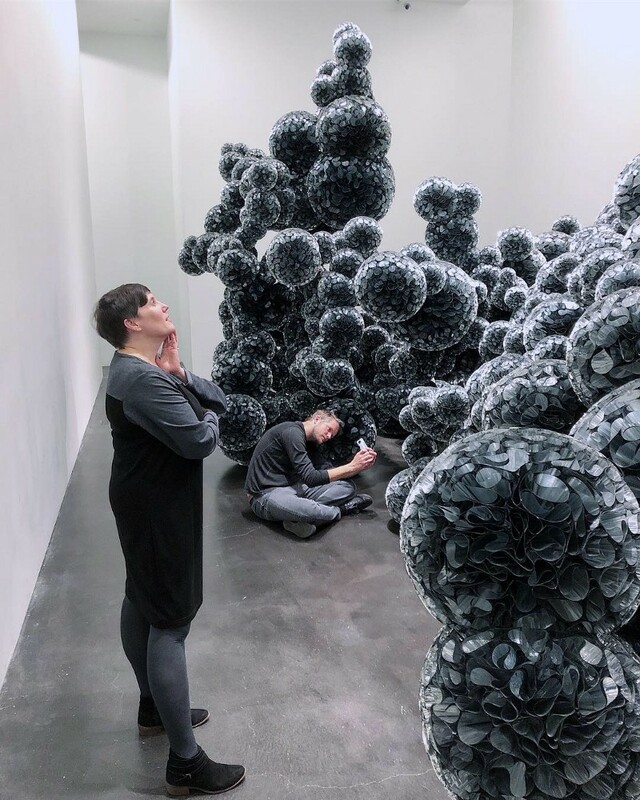 My focus shifted away from how to convey what I was learning to an offsite audience following on social media and away from wondering what concrete takeaways I’d be bringing back to my own museum at the end. Instead, MCN 2018 reminded me that we are at our best when we’re in fellowship. It’s a tumultuous, frightening, frustrating time in the world. Networks like this one are our best support structure for sustaining the energy for the important fights. Thanksgiving came less than a week after MCN 2018. So what better way to leave my post-conference reflections than a gratitude lens? I’m grateful for this group of dedicated, creative, smart, outside-the-box thinkers. These are people who remind me that I’m not alone in wanting to make change in museums, and I’m not alone in wanting to celebrate the joy of direct experience with objects that museums offer, either. Two photographs in different galleries of the Tara Donovan exhibition at MCA Denver. 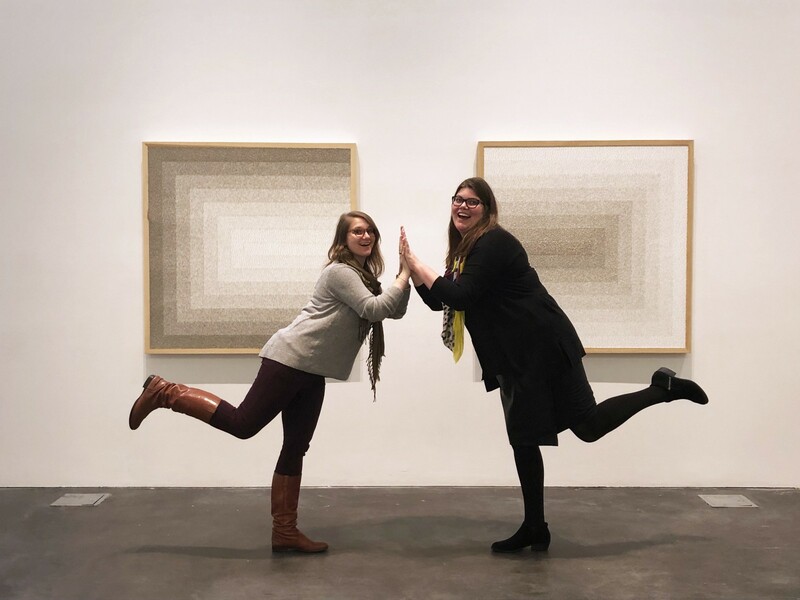 L: Meagan E. and Emily Lytle-Painter lean into each other with the palms of their hands together and one foot in the air. R: Jennifer Foley and Koven J. Smith contemplate one of Donovan’s mylar sculptures. I’m not alone in feeling emotionally drained, nor in needing new and different ways to find revitalization. Other people are also grappling with big thoughts in the museum realm (Micah’s Thoughtforms highlights some of them), and other people are also opening up new avenues of conversation about those big thoughts (go nominate people to join Koven and suse’s proposed Musetech Charter convening). I’m grateful for an MCN 2018 full of these reminders. We are all working hard through times that are harder. An image from my Instagram feed of a bright pink Post-It note on an ivory wall, reading “KEEP GOING”, with an arrow pointing to the right. I’m a museum adventurer on an ongoing quest to make museums the fun, inclusive, exciting spaces they can be.